BEIJING, Oct. 30 (Xinhua) -- The 12th National Women's Congress (NWC) opened in Beijing on Tuesday. President Xi Jinping, also general secretary of the Communist Party of China (CPC) Central Committee and chairman of the Central Military Commission, attended the opening of the congress at the Great Hall of the People. The meeting was also attended by other leaders of the CPC and the state including Li Keqiang, Li Zhanshu, Wang Yang, Wang Huning and Han Zheng, all of whom are members of the Standing Committee of the Political Bureau of the CPC Central Committee. Zhao Leji, also a member of the Standing Committee of the Political Bureau of the CPC Central Committee, delivered a speech on behalf of the CPC Central Committee. A total of 1,637 delegates from all walks of life and 79 specially-invited delegates from the Hong Kong Special Administrative Region (SAR) and the Macao SAR, attended the congress. Shen Yueyue, vice chairperson of the National People's Congress Standing Committee and executive chairperson of the presidium of the 12th NWC, announced the opening of the meeting. Women's federations at all levels have taken Xi Jinping Thought on Socialism with Chinese Characteristics for a New Era as a guide, and made new contributions to the development of the women's cause and consolidating public support for the Party's governance since the 11th NWC, Zhao said. 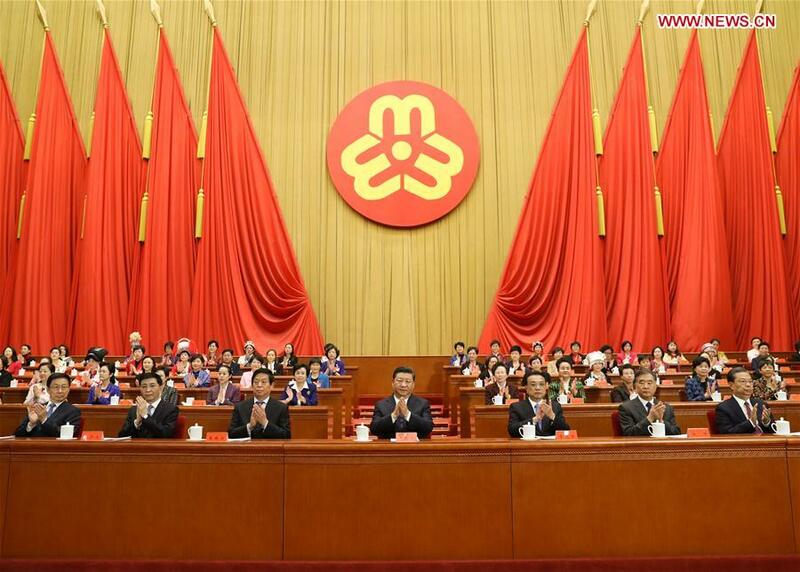 Xi's discourses about women and the work of women have provided fundamental rules for the cause of women and the work of women's federations in the new era, he noted. Zhao called on Chinese women to have firm ideals and convictions, act under the guidance of Xi Jinping Thought on Socialism with Chinese Characteristics for a New Era, contribute to the new era, advance the great cause, and continue their efforts to achieve the two centenary goals and the Chinese Dream of national rejuvenation. When making a report on behalf of the 11th Executive Committee of the All-China Women's Federation (ACWF), Huang Xiaowei, executive chairperson of the presidium of the 12th NWC, called for holding high the great banner of Xi Jinping Thought on Socialism with Chinese Characteristics for a New Era, and contributing to securing a decisive victory in building a moderately prosperous society in all respects and realizing the Chinese Dream of national rejuvenation. A draft amendment to the ACWF constitution was submitted to the delegates for deliberation.